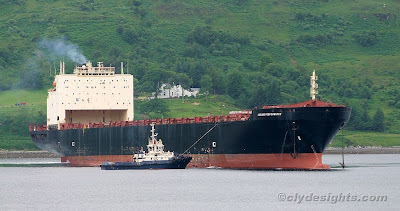 The first view shows the containership SEALAND PERFORMANCE turning within the confines of Loch Striven just to the west of Inverchaolin, with assistance of two Svitzer tugs, SVITZER MILFORD on her starboard shoulder and AYTON CROSS working at her stern. Both anchors had been walked out in readiness for lowering. The orange buoy just ahead of SEALAND PERFORMANCE was there to indicate the position that her port anchor was to be lowered - a similar buoy had been placed by the Clydeport workboat TORCH to show where her starboard anchor was to go. TORCH is seen checking that the ship was lying correctly and that her anchors had been run out as planned. 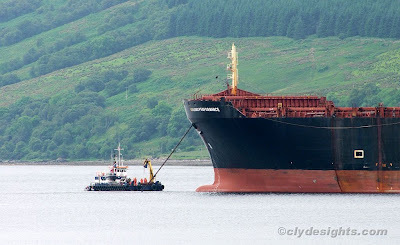 As SEALAND PERFORMANCE was the first ship to enter the loch, positioning her accurately was important, as all the other vessels would be anchored in positions relative to hers.